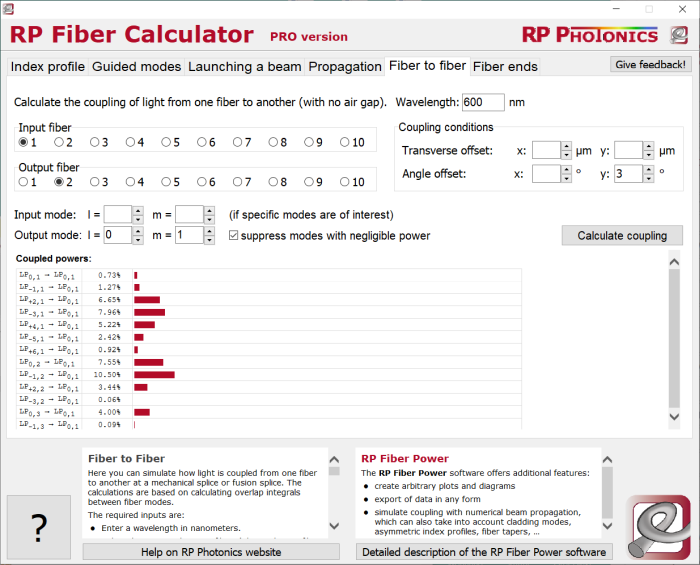 Here we explain in detail how the RP Fiber Calculator software is used. Each of the menu items explains one of the tabs. In this tab you can calculate how efficiently light can be coupled from one fiber to another. (This functionality is reserved for the PRO version of RP Fiber Calculator.) It can be important to check such things numerically, as the results of wave optics can be quite surprising. Enter a wavelength in nanometers. Set the coupling conditions. There can be a transverse offset of the fiber cores and also an angle offset. It is assumed that there is no air gap between the fibers; an angle offset of a splice can nevertheless result from non-normal cuts of fiber ends. You may or may not define specific modes of the input and output fiber via their l and m indices. Note that different orientations can be specified – see below. An air gap, which would lead to additional reflection losses, is not assumed to exist here. If you enter a specific input and output mode, you obtain the coupling loss only for that pair of modes. Also, you obtain the total power coupled to all other guided output modes. If you enter only an input mode, you obtain the coupling of that mode to all modes of the output fiber. Also, the total power transmission is given. If you enter only an output mode, you obtain the coupling of all input modes to that output mode. If no specific input and output modes are specified, you obtain for each input mode the total power coupled into guided modes of the output fiber. Also, the average coupling loss is displayed. That gives the effective coupling loss if all input fiber modes carry the same optical power. Modes with l ≠ 0 can have two different orientations: one with a cos l φ dependence and one with a sin l φ dependence. You can get the latter by specifying a negative l value. If you have a specific input or output mode, only the specified orientation is taken into account. For example, if your input mode is LP−1,1, only the sin φ orientation is considered. If you have arbitrary input or output modes, all possible orientations are taken into account. What is the Total Coupling Efficiency? You may want to know how much power overall can be coupled from one fiber to another. If the input fiber is a multimode fiber, that will depend on how the power in that fiber is distributed over the modes, since the coupling losses can be strongly mode-dependent. In some cases, you may assume that you have an approximately uniform distribution of power over the modes. In that case, the total coupling can be approximated by the average coupling of all modes. You will find that value below the table of coupled powers if you do not specify input and output modes. In some cases you may obtain quite surprising results. For example, simulate the coupling of two step-index multimode fibers, where the output fiber has a larger core and/or a higher NA. You may be surprised to find substantial coupling losses in such a case, which have a strange wavelength dependence. Our tutorial on fiber optics discusses such a case in chapter 6. For fibers with only a couple of guided modes, the calculations are fairly quick; they can usually be done within a few seconds. If there are dozens or even hundreds of modes, however, the calculations can take a substantial computation time. Note that the software needs to consider a very large number of pairs of modes in such cases. Note that there is a trade-off between numerical accuracy and computational speed. Therefore, you may e.g. get 99.9% coupling displayed where theoretically it should be 100%.